George Ezra today continues his phenomenal ascent with the announcement of his first ever headline arena tour. The tour takes in 10 arena shows across the UK beginning at the Metro Radio Arena in Newcastle on Thursday 7 March. Tickets the for show go on sale at 9am on Friday 17 August and will be available online from our affiliate Ticketmaster UK: http://bit.ly/GeorgeEzraNCL. The announcement comes fresh from George headlining Boardmasters Festival and ahead of his long since sold out autumn 2018 UK tour this November. His acclaimed number 1 album Staying At Tamara’s ​is officially the biggest selling album released so far this year and remains in the top five of the Official Albums Chart 20 weeks after release, whilst his current single ‘Shotgun’ became his first ever number 1 single in June. Staying At Tamara’s is George’s second UK Number 1 album, hitting the summit in March. Staying At Tamara’s also features lead single ‘Paradise,’ which peaked at Number 2 in the UK singles chart and has now been certified Platinum, and ‘Hold My Girl’, ‘Pretty Shining People’, ‘Saviour,’ and ‘Don’t Matter Now’. The album is available in digital, CD, cassette and vinyl formats, and arrived nearly four years after the release of his multi-platinum and also-chart topping debut album ​Wanted On Voyage​. Not content with hitting the summit of the album and singles charts, George is also a chart-topping podcaster, with his series ​George Ezra & Friends​ shooting straight to number 1 on the iTunes Podcast Chart on launch and being nominated for numerous awards. 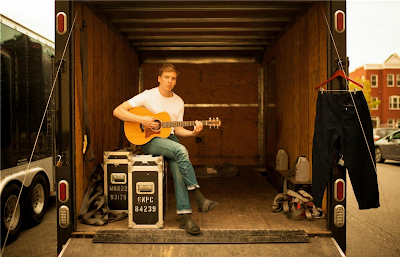 ​George Ezra & Friends​ is a unique podcast series in which he spends an extended period of time with a musician friend in an often intimate, funny and revealing one-to-one conversation. Series 1 recently wrapped up with a no holds barred chat with one of music's all time legends, Elton John, which followed previous episodes with Ed Sheeran, Lily Allen, Sam Smith, Craig David, Rag’n’Bone Man, London Grammar’s Hannah Reid and many more. Tickets will go on sale 9.00am Friday 17th August and are available online from our affiliates Ticketmaster UK: http://bit.ly/GeorgeEzraNCL, from the booking hotline number 0844 493 6666 or in person from the Metro Radio Arena Box Office. Please note venue facility and booking fees will apply. Under 14’s must be accompanied by an adult and must hold a seated ticket (under 14’s are not allowed in the standing area). A maximum of 6 tickets per person with names on tickets – full rules below. To make sure that as many tickets as possible get into the hands of genuine fans, the full name of the lead booker will be printed on each ticket, and the lead booker’s photo ID will need to be presented on entry to the venue. If you are buying more than one ticket your guests will need to enter at the same time as you, failure to do so will result in guests being turned away. If the lead booker is unable to attend the gig then please contact Ticketmaster UK via their helpdesk. Tickets can only be resold via our official resale partner Twickets, at face value or less – resale of tickets through any other channel will lead to those tickets being cancelled. Please only purchase tickets from the venue’s official ticketing partner Ticketmaster or those listed on GeorgeEzra.com to make sure you’re buying tickets at the right price, from the right place.